Custom lettering / graphics for all window types. Vinyl lettering and graphics have a permanent adhesive lasting 6+ years outdoors. Our premium vinyl resists fading and is not affected by gasoline, oil or other solvents. Vinyl letters / graphics are easily applied (see below for our guarantee). Available in a variety of colors. Graphics are also possible. On most windows light colors show up best, dark colors blend in (except for frosted glass). Plate glass has a very dark appearance as shown in photo on left. Note: We can cut for either installation on inside or outside of window. Note: If doing your own design, use a black background to represent the window. That provides the best method of showing how lettering will contrast with a plate glass window. Self-adhesive lettering comes precisely positioned on a transfer tape. You don't have to position each letter. Simply remove the backing paper, press to apply, and remove transfer tape. Just the lettering or graphic remains permanently attached. We provide application fluid, vinyl squeegee and easy to follow instructions with every order. If you make an error, we'll recut for free. Our customers have a 98% success on first try & most have never installed vinyl before. Provide us with a description or file of what you need. Size of the area where you want to apply graphics is important. We'll send sample layouts based on your request. We don't always get your design right on the first try. Just reply to our email with your changes. We'll provide a new layout file. Revisions are never a problem. 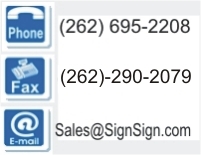 Once the sign design looks like you want it, click here for our Sign Order Form. For a description, enter the name of the file you approved. We'll confirm your order and provide a shipping date. On shipping, UPS will send the tracking information via email.